From Kazakhstan Today: "Almaty. North Atlantic Treaty Organization (NATO) has officially invited Kazakhstan to take part in peace-making operation for restoration of Afghanistan. NATO Secretary General's Special Representative for the Caucasus and Central Asia, Robert Simmons, informed, the agency reports citing Independent newspaper. According to R. Simmons, all the documents have been sent to the Kazakhstan party. 'NATO representative emphasized that Kazakhstan army already reached the level of compatibility with the NATO armies and will successfully demonstrate itself in the Afghani mission. However, R. Simmons said that in any case Kazakhstan will make final decision whether to send peacemakers to Afghanistan or not.'" NATO releases new report of Allied contributions to ISAF. Medvedev signs new National Security Strategy which identifies NATO and conflicts over energy sources as threats to Russia. From the Guardian: "The document, which will form Russia's national security strategy until 2020, also warns of the threat posed to Russia by Nato. The paper says Moscow wants a 'fully fledged strategic partnership' with Washington but is opposed to the US's plans to develop a missile defence system in central Europe. He went on: 'Russia is seriously concerned about the growing gap between the US and Russia in the military field, and about America's attempts to dwarf Russia's nuclear potential by creating new arms systems, placed close to Russia's borders and in space. It is also worried about the US's high-precision, long-range, non-nuclear weapons.'" For intriguing background on the development of Russia's new National Security Strategy, see Pavel Felgenhauer's work at the Jamestown Foundation. "Isolationism is passé - Sweden needs to join NATO"
Birgitta Ohlsson, foreign policy spokesperson for Sweden's Liberal Party argues for Sweden to join NATO. From the Local: "The EU is not a military alliance and is therefore not an alternative to NATO. The reintegration of the French military into NATO is a clear sign that even the French have given up on the idea of having a competing organization as a counterbalance to the United States. We have to face up to reality. If we really want Sweden to take joint responsibility for Europe’s security then Sweden needs to play an integral role in the context of European and transatlantic defence. A combination of the EU’s civilian skills and NATO’s military acumen represent the future for European – and, by extension, Swedish -- security. It's disingenuous to have so few Swedes aware of the fact that their country is in practice already part of NATO. Sweden has a lot more soldiers under NATO Command than under the UN flag, and many Swedes are unaware that we have a NATO ambassador with her own secretariat at NATO headquarters in Brussels. Yet we allow Swedish soldiers’ lives and security to be decided at meetings where we have very little say. If we were members we would be able to take responsibility and exert a far greater influence over these operations. As it stands, we have to rely on others to take responsibility. Really Sweden has already taken the step from neutrality to solidarity vis à vis our security policy. All that remains to seal the deal is NATO membership." U.S. Senator Jeane Shaheen, chair of the Senate Foreign Relations Subcommittee on European Affairs, draws attention to the need for hard choices within the alliance. From the Boston Globe: "NATO will simply not be able to meet every challenge that threatens its members. On some issues, NATO will take the lead. But on others, NATO will have to partner with other international institutions, like the United Nations or the European Union. As we rewrite the Strategic Concept to guide the next decade of NATO operations, we must clearly define when NATO should lead, when it should collaborate with other international organizations, and when it should take a back seat." A small step forward in NATO/Ukraine relations. From defpro.com: "Within the framework of NATO-Ukraine cooperation the meeting of Joint Working Group on Defence Reform (JWGDR) and planning conference on the program of development of civilian staff employed in the defence sector is being held on 13th-15th May 09, as reported by Poland's Ministry of National Defence. Directors of defence policy departments of NATO member states, partner countries and institutions, such as: Geneva Centre for Democratic Control of Armed Forces and Royal Institute of International Affairs (Chatham House) as well as counselors on defence issues from the Ukrainian Ministry of Defence and General Staff participate in the meeting co-chaired by Assistant Secretary General for Defence Policy and Planning Jiry Sedivy and first dpty of the Secretary of the Ukrainian Council of National Security Stepan Havrysz. The goals of the conference will be the assessment of the Ukraine’s way to the integration with NATO structures and its development in security and defence sectors. The talks will concern, among others, the state of implementation of Ukraine’s Annual National Plan and projects run under the Group auspices. This meeting is of great significance for the future of NATO-Ukraine’s cooperation. This is the first JWGDR meeting on that level organized by a NATO member. Thus far, the sittings were held in Brussels or in Ukraine." Speaking at the Atlantic Council, NATO's military commander addresses continuing weakness within the alliance. 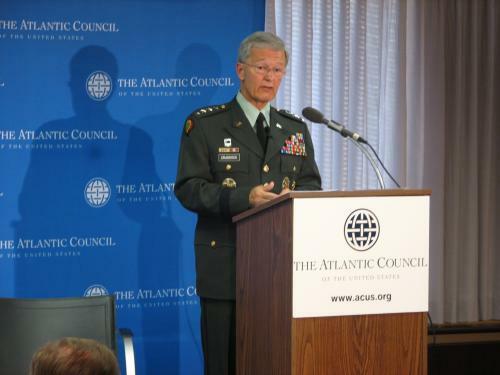 From the New Atlanticist: "Supreme Allied Commander John Bantz Craddock told the Atlantic Council that 'political leadership in NATO is AWOL' and that fixing the 'imbalance' between an enormous strategic ambition and modest political will is vital for success in Afghanistan and elsewhere. The general acknowledged Afghanistan as the most vital mission of the Alliance and stated that there are three strategic objectives: security and stability, good governance, and reconstruction and development. While NATO has a direct role in only the first, it has an indirect role in the other two. While acknowledging the constant refrain of 'We don't do nation-building,' he said that strengthening Afghan governing institutions was 'the critical path' to operational success. He declared, 'We can be perfect in securing the area but if government fails, we fail.' While this is ultimately the responsibility of the Afghan leaders themselves, Craddock contends NATO has not done enough to help them along. More fundamentally, the Alliance has not kept its promises. It has not come close to funding the objectives it set for itself in 2006, upon taking control of the mission, and it is clear that the domestic political interests of NATO member states have been paramount over Alliance goals — even though said goals were achieved through painstaking consensus building. Craddock understands that political leaders in democracies have to consider public opinion. At the same time, however, he said 'It's the job of leaders to persuade the citizenry' on important foreign policy goals and that 'often, this has not been the case.'" <a "Defence Ministers of the Nordic countries will be meeting in Helsinki this coming Tuesday and Wednesday for talks on tighter defence cooperation. Earlier this year, a report drawn up by a group headed by former Norwegian Foreign Minister Thorvald Stoltenberg proposed that the the Nordic countries jointly take responsibility for Icelandic airspace once the United States closes its base at Keflavik, Iceland. According to Finnish Defense Minister Jyri Häkämies, participation in such an arrangement would be too expensive for Finland. 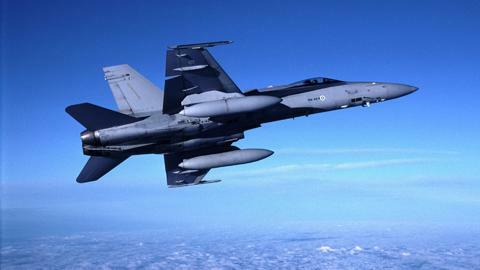 'This is primarily a matter of the supervision of the airspace of a NATO country, so it is also a political question. And it would not be free. The air force's budget has just been balanced, and the first order of business is not to send planes off somewhere,' Häkämies told Turun Sanomat." "SINGAPORE--Asian states led by China, Japan and South Korea are expected to spend some $60 billion to beef up their navies in the next five years, an industry analyst said Monday. That is bigger than what NATO countries -- excluding the United States -- are forecast to spend for new naval construction in the same period, said Bob Nugent, vice president of US-based naval consultancy AMI International. The world's biggest spender will remain the United States at a little above $60 billion between now and 2014, Nugent said here on the eve of IMDEX Asia 2009, Asia's top maritime defense show. Non-NATO European countries led by Russia are forecast to spend $11 billion on new naval capabilities in the next five years, he added." "In spite of Russia objections and opposition activities, NATO war games, called Cooperative Longbow 09/Cooperative Lancer 09, began their active phase in Georgia today. Nineteen countries with 1300 servicemen were invited to participate. Six countries, Kazakhstan, Latvia, Estonia, Moldova, Serbia and Armenia, later pulled out of the games, however. Cooperative Longbow 09 is a command post operation conducted at Georgian military headquarters in Tbilisi, according to Media Monitors Network, while Cooperatives Lancers 09 is a field exercise. Activities have been underway in Georgia since May 6, and the opening ceremony for the weapon-less games took place yesterday. The exercises will last a month in all."